The HeroCats of Stellar City seek to protect it from injustice. Midnight is the one known as the Claws of Justice and works to keep convicts behind bats. 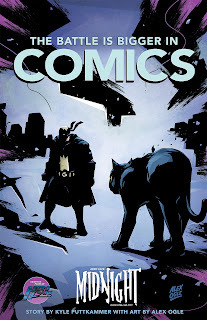 And now he's getting the solo treatment in his own trade paperback called HeroCats: Midnight Over Stellar City. The work is written by Kyle Puttkamer and illustrated by Alex Ogle. The HeroCats: Midnight Over Stellar City TPB, is available through your local comics retailer and is slated for a March 23rd, 2016 release through Diamond Order Code JAN160987. Midnight must track down the sinister Crow King in order to rescue fellow HeroCat Bandit. Battling through robotic crows and nightmares brought to life, he’ll face the master of dreams and goes one on one with the man responsible for all of Stellar City’s problems..the hero know as Galaxy Man? The hit series HeroCats: Midnight over Stellar City gets collected for the first time. PITTSBURGH, PA- He’s the Claws of Justice, Born at midnight, he’s the dark avenger making sure convicts stay where he puts them..behind bars. 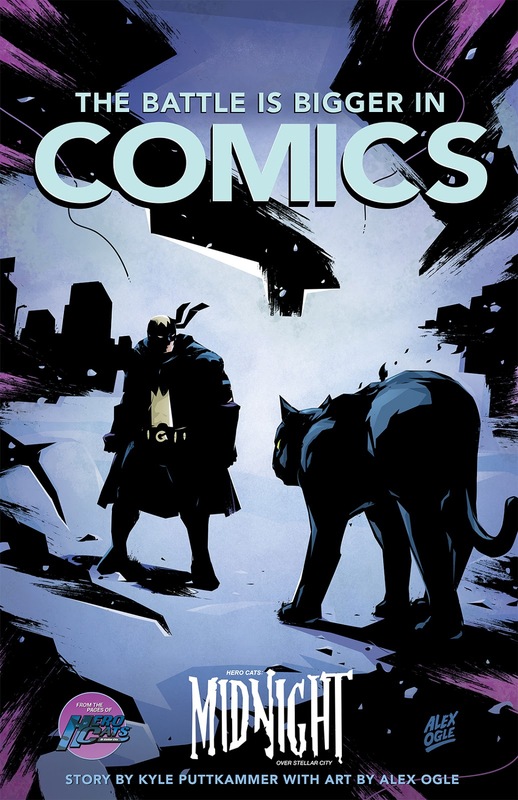 Now, one of the most popular of the team known as the HeroCats of Stellar City stalks the shadows in his first trade paperback, HEROCATS: MIDNIGHT OVER STELLAR CITY. Written by HeroCats of Stellar City creator Kyle Puttkamer with artwork by Alex Ogle, Midnight must track down the sinister Crow King in order to rescue fellow HeroCat Bandit. Battling through robotic crows and nightmares brought to life, he’ll face the master of dreams and goes one on one with the man responsible for all of Stellar City’s problems..the hero know as Galaxy Man? The HeroCats: Midnight over Stellar City TPB, is available through your local comics retailer and is slated for a March 23rd, 2016 release through Diamond Order Code JAN160987.